The Stanford Seed Transformation Program is a 12-month, intensive leadership program for established business leaders which includes four, week-long immersive sessions spread over a six month period. 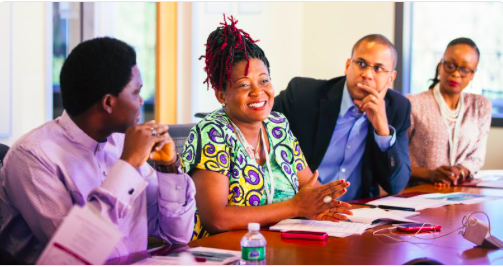 Designed specifically for business owners, the program is delivered in-country (Accra, Ghana) and led by Stanford Graduate School of Business faculty. The goal: is to create a detailed action plan to help you grow and scale your company. Founders and senior leaders of for-profit companies, across all industries, with annual revenues between USD $150,000 and USD $15 million and that are headquartered, legally registered, and currently operating within West Africa. Develop the skills, tools, and mindset to grow and scale your business, create jobs, and lead your region to greater prosperity. Gain essential business and leadership skills, from strategy and finance to business ethics and design thinking, all taught by world-renowned Stanford faculty, and local business practitioners. Get support from trained local facilitators to help you introduce what you’ve learned to your company and promote buy-in.